Review: An adaptation of Vera Brittain’s memoir about her experiences during World War I. She decides to abandon a hard-won place at Oxford University and she joins the medical corps as a nurse. A really important story to be told. Alicia Vikander’s part was originally earmarked for Saoirse Ronan. An amazing performance once again from Alicia Vikander (other being A Royal Affair, 2012). Fantastic ensemble cast who all gave it their best. This film was shot on various locations in Yorkshire, Oxford and London. The themes that occur in this are the futility of war, falling in love at a young age and how to make sense of the darkest times. 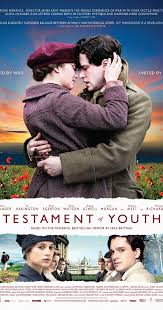 I found this to be a very moving film.